Bosch bike motors | HIGH COUNTRY EBIKES | One of the BEST motor options! Why a Bosch eBike system motor? Bosch is a respected brand of German-manufacturer. They make lots of high-performance motors and electrical appliances. They recently entered the electric bike motor market in 2010. Several dealers of electric bikes in Salt Lake City, like High Country E Bikes, sell Bosch motors. With the reputation that Bosch has, you know they'd immediately enter the industry as class-leaders. And they're continually improving. The fact that Haibike Electric Bikes, the undisputed leaders in the e bike industry, chooses to use both Yamaha and Bosch motors, demonstrates the quality you're going to get when you select a Bosch. A lot of customers feel like the Bosch gives them more power than the Yamaha. Many of the new 2018 XDURO models of Haibike feature Bosch. iZip, Felt, and the Yuba brands of e bike also use Bosch motors. A lot of customers like the more extended range on the Yamaha motor, so depending on how you'll be using the e bike, you'll want to consider the two motor options carefully. On the Bosch power-systems for e bikes, three sensors measure the torque, speed, and acceleration more than 1000-times-per-second, ensuring perfect interaction between the rider and the electric bike. The Bosch motor has an ISIS crank axle, which can be a preferred mounting method for the cranks to the motor axle. The Bosch motor uses the ISIS drive setup vs. the Yamaha electric motor, which uses the square taper type. The size of the Bosch battery-charger is smaller than Yamaha's and is easier to carry around. If you commute with your ebike, or you take your charger on mountain biking trips, this charger can extend your range with greater convenience. The Bosch charger has little rubber feet on the bottom, which stops it from sliding off the workbench, making the Bosche electric bike motor easier to repair. Your Haibike dealer can update the Bosch system via the USB diagnostics socket. The socket is an exciting feature because it means future updates are always possible to your Bosch motor. The manufacturer is likely to bring new features in the coming years. The Yamaha system is currently not updateable. 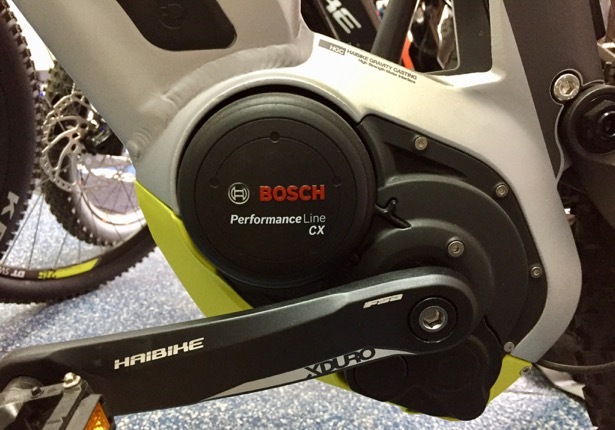 What Haibike Electric Bicycles Use Bosch Motors?